While I looked hard for an image that would work with the last story I came across these two and thought I should share them. 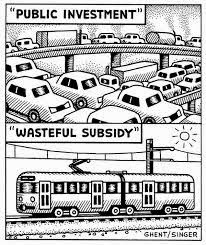 The first one so accurately symbolises the state government folly in building more roads rather than investing in public transport. 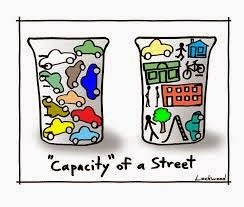 The later symbolizing the new push to make our streets available for other activities rather than just parking and transportation. The new plans for King William Rd have embraced some of these concepts. You might find the links below interesting? It is now 5 years since the state's 30 year plan for Greater Adelaide was announced. In the article today titled "Drive to supersize our city numbers". It seems John Rau thinks that Adelaide could comfortably become home to another million people. It is true that at one time Unley had a much higher population than it does now, and as such the sewers and roads should be able to cope with a higher number today. Believe it or not urban infill has occurred at a greater rate than than government anticipated. If the plan is to be reviewed this is timely for residents, and that was all of you, who do not want increased density in Clarence Park and Black Forest to let Mr Rau know what you think. I'll let you know when he calls for submissions. Welcome to 2014 SALA in Unley. Discover art in a local gallery, shop, business or studio. Discover emerging artists, established artists, community groups, visual art, sculptures, ceramics, photography, mixed media, and much more…. This year’s South Australian Living Artists (SALA) Festival runs from 1st to 24 August, showcasing South Australia's visual artists’ talent and creativity. The SALA Festival celebrates local community and diversity. Over the past seven years, SALA in Unley has boasted more venues and artists than any other metropolitan region and continues to maintain its popularity. This year over 40 venues in the area host a myriad of artists in all different mediums. Celebrate the final day of this year’s SALA (South Australian Living Artists) Festival at SALA on Show on Sunday 24 August, 10.30am – 5pm at the Soldiers Memorial Garden and Unley Shopping Centre on Unley Road, Unley. This huge day of visual art activities includes a pop-up gallery with art works for sale, artists in residence, free family art workshops and entertainment throughout the day. Rediscover the passion of a 1920 mayor, those who fought for a people’s park and the 230 donations made to save this green space. Heywood Park is one of the City of Unley’s largest and best-loved green spaces. What many people may not know is that it almost did not exist. Purchasing Heywood Park: £1 at a time, the current exhibition at the Unley Museum, traces the race during the 1900s to raise funds and secure this valuable open space. Had it not been for William Harold Langham, Mayor of Unley 1919-1920, Unley residents may have lost this popular picnic spot. It was a widely discussed and debated issue with heated letters appearing in the newspapers and disgruntlement within Council. Elizabeth Hartnell, Unley Museum Curator says “As it captured the public’s imagination in 1920, the story continues to resonate with local residents today. After rate payers voted against the purchase, Mayor Langham rallied the people of Unley and others around the state to donate to a subscription fund.” Public support was such that £4000 was received in 4 days. Donations ranged from 5 shillings to 500 pounds ($12 to $25,000 in today’s money). As a result, Heywood Park became a “people’s park” opening in 1921 with 9000 people crowded under its gum trees. Purchasing Heywood Park is an exhibition about the passion of a mayor, those who fought for a people’s park and the 230 donations made. Read through original hand written notes of encouragement and support that accompanied donations. Check the alphabetical list of donors to see if your family was one of them. Follow the heated and at times bitter debate among councilors as reprinted in the daily press. See photographs of Heywood Park as it was in the early 1900s. Purchasing Heywood Park is on display at the Unley Museum from now until 24 September 2014. Open Monday to Wednesday 10.00am - 4.00pm, Sunday 1.30 - 4.30pm. Closed on public holidays. Admission is free. Funding for TOYS at CPCC; The TOYS coordinator's position has, up until now, been funded by Council. The Community Centre Review recommended that CPCC take over the funding of this position. The coordinator still has the option of retaining employment with Unley. However, after much discussion CPCC Board has decided to request transitional funding in order to be given time to increase income to avoid reducing savings that are earmarked for long service leave and sick leave of staff and replacement of assets. Funding for 2 years (1+1) was approved. Kaurna ILUA Liason Committee; This calls for nominations to a position on the committee. I am becoming concerned, as are some of my co-councillors, that the staff are being invited to enter the debate and not as a resource from which to seek clarification. I expressed my opinion clearly at last might's meeting. It didn't stop the Mayor from inviting them to but it did stop the staff from unnecessarily giving their opinion, at least for this meeting. This story in the Sunday Mail caught my eye yesterday. to compare the cost of something to a cup of coffee certainly makes one realise just how low the spend is. Ans it would be difficult to find a coffee for $3.00 anywhere in Adelaide in 2014. South Australia's spend is half that of Western Austrlia and Queeensland; that is despite an undertaking by the state government to double the cycling participation rate. It is also falling. What people continue to want to access is safe, dedicated bikeways that allow them to get where they want to go. The recently completed Greenways project is , therefore, a welcome spend in Unley as is the completion of this under Anzac Hwy/Greenhill Rd. Its not often I get to attend these events. this one was amazing, with over 1400 people attending the dinner to celebrate the achievements of the Show Society. 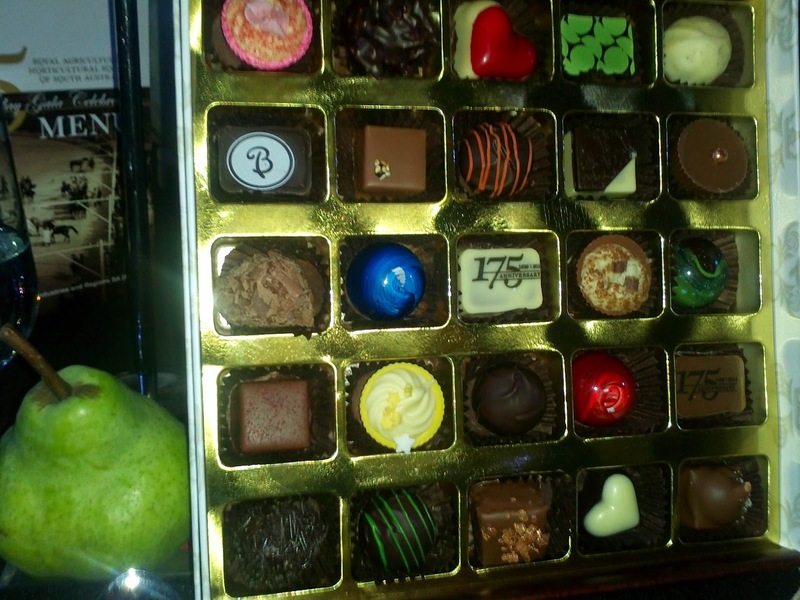 I don't usually take photographs of food but these chocolates not only looked good they tasted even better. Congratulations to them. Remember the old days when you called your Council and told them that there was dumped rubbish in your street, or the bin hadn't been emptied or something else was bothering you that you thought could be done more efficiently? And what happened? The girl who answered the phone (and still does) was polite and confident and told you she would pass the information onto the best person for the enquiry and the chances were you never heard from them again and what you enquired about may or may not have been done. The only way you knew this was from your own personal observation. After you had called a few times and nothing had happened you either gave up or contacted your local councillor. They were often able to get the job done as they knew the right person in the organisation to talk to. Residents will be pleased to know that the planting of the trees in Canterbury Tce and Parker Tce is now imminent. 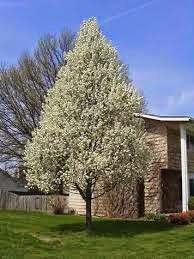 The variety chosen by the majority of residents (chosen from a very short list provided by Council and DPTI) is the Pyrus calleryana 'chanticleer'. They will certainly make a difference to how the streets appear at the moment. What a pity that so many can only find the faults in local government and never all the wonderful things that do get done and the great people that make them happen (both staff and councillors.) Bullying is unacceptable in any situation. Why then was the editorial not about bullying in the workplace; it would have been worth accolades? The article is reproduce below to see what you think? I remember very clearly how it felt to be bullied and treated differently to others in the early stages of this council term, it doesn't feel good and reflects poorly on the Council and the perpetrator. As you will no doubt be aware, work has started on Millswood Station to prepare it for the proposed 12 month trial. At this stage it is envisaged that the trial would be starting in early November 2014 and will be used to gather information on actual patronage. Surveys are only a guide but nothing is as good as collecting patronage data. 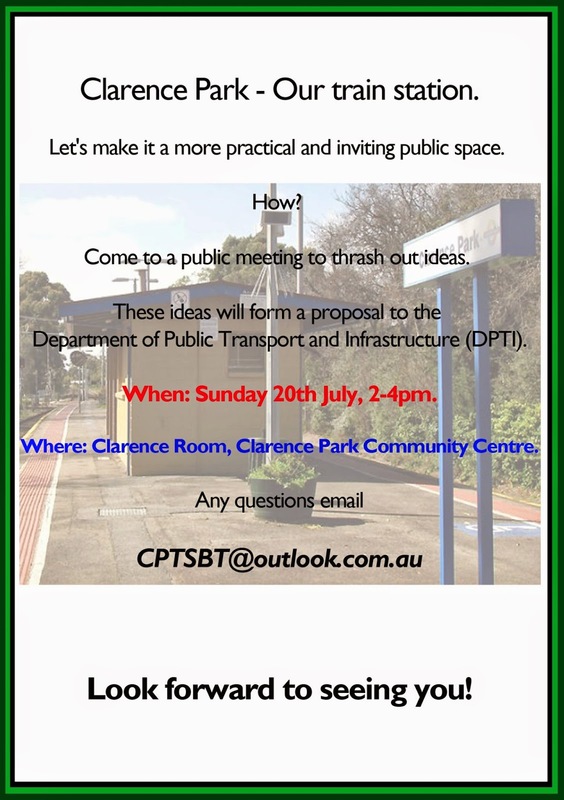 The Department of Planning, Transport & Infrastructure (DPTI) have prepared a draft Belair train timetable and are seeking comments. You can have a look at their draft timetable and make comments. When you look at their draft timetable you will see that the train will bypass Millswood Station on 9 occasions. These occur on 4 occasions in the morning during peak hour travel for commuters going into Adelaide and on 5 occasions in the evening during peak hour for commuters going leaving the city. It should be noted that at no other station on the line are there any other bypasses. Three members of the “Reopen Millswood Station” committee had a meeting with members of DPTI to discuss the reasons for the draft timetable. Mr Graham Sibery, DPTI Executive Director Operations & Safety explained that it is a question of balance for the whole of the Belair Line and that they don't want to reduce the frequency of service for existing patrons further up the line. He did however welcome everyone’s comments through their survey. So now it is up to you. We strongly urge you to complete their survey and let them know what you think. Otherwise we will just be accepting what they give us. encouragement of using the station and also giving out information. At the last committee meeting, we discussed the idea of holding an official launch at the start of the proposed trial. A possible date for the official launch might be Sunday15th November. At this stage we are only at the planning stage and would welcome input from the community. in November. The planning meeting will be held at 7.30pm Thursday 14th August at Clarence Park Community Centre on East Avenue. Everyone is welcome to attend and have some input. Remember it will be a case of “Use it or Lose it” during the trial. You can now use BPAY View to pay your rates if you wish. 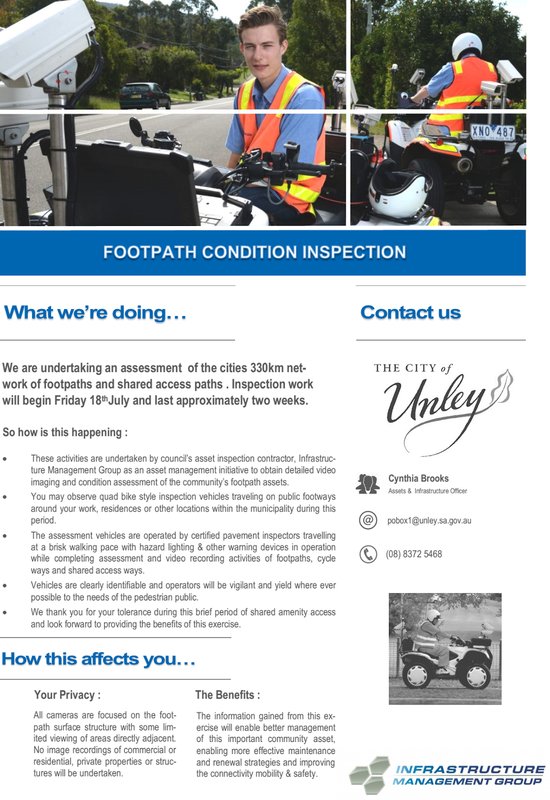 The following information is on the Council website http://www.unley.sa.gov.au/page.aspx?c=31672 . I still prefer to get the account in the mail but this might be of help to some people. I attended the first 2 hours of Mitcham's Council meeting yesterday. This was just to hear the deputations. I went to hear the deputations from SOCKET(Brown Hill Creek owners) and Ron Belchambers to the meeting. Even though allowed only 3 minutes to speak I think each got about a half and hour. There was also a deputation from another creek owner. SOCKET were taking the same argument to Mitcham as they did to Unley the week before; that is that a dam should be the first option, creek cleansing (feral vegetation, degraded creek banks, etc) and that creek widening and deepening was not acceptable to the creek owners and acquisition of their property by legal means would be very expensive. Ron repeated his argument that a dam would cause devastation to the upper reaches of the creek that were unacceptable to him and the 10,000 people who have signed his petition. The problem is that most people who signed the petition will not be affected one way or the other if the creek floods. The following is an excert from today's Advertiser. I couldn't believe that this project was so outstanding. The certainly wouldn't have won any accolades for community consultation. INITIALLY dubbed "mission impossible" by the Department of Planning, Transport and Infrastructure, the Goodwood Junction rail grade separation picked up the award for projects valued between $20 million and $75 million. The $45 million project was regarded as having a highly ambitious timeline and several potential roadblocks, but joint venture partners Thiess and York Civil delivered the project on time and on budget. Good to see in today's paper that Gill Hicks has decided to run for Unley Council in the elections later this year. She is a high profile and probably very capable woman who has the potential to bring her skills and knowledge to work for the betterment of the City. Running in Goodwood she has decided to run against two competent incumbents which may make her task difficult. What I do know is that the current gender ratio on Unley is 2:11 which is in no way representative of the community. There seems to have been some painting out of the graffiti opposite Cromer Pde, it was painted out in olive green despite the colour of the fence. Oh, there is so much to be said for all the fences being the same shade of something more attractive and always painted out in that colour. Well it looks better, but the graffiti in the freight corridor and on the new infrastructure seems to be invisible to DPTI staff. The footbridge over Goodwood Rd is now fully repaired. The information on why they chose a particular candidate were also interesting as this was often only decided on personal knowledge and information in the election pack and not the pamphlets stuffed in your letter box. Why have you chosen not to vote in the past? 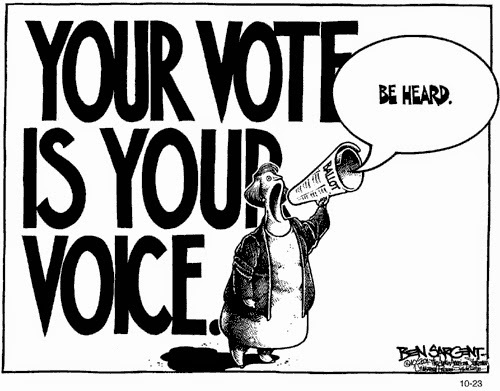 What do we need to do, first of all to get you to vote and then to vote for a particular candidate? Recent documents that we have been asked to have a look at make some good recommendations for the future of local government. Others are just one step toward an additional level of governance and/ or Council amalgamations on an unprecedented scale. While I like the suggestions of limited tenure for Mayors (3 terms) and compulsory voting I know that regional governance is not a step in the right direction. What our community likes about the way it is , is the fact that local government is local and you can just pick up the phone or send and email and the person you sent it to will answer it themselves and almost certainly address your concern themselves. It seems inevitable that Development Assessment Panels as we know them will be a thing of the past. Regional DAPs will be introduced and they will have no members of Council on them. John Rau, seems to think that there is no place in development assessment for Councillors and that a panel of experts will be better able to make the decisions. My problem is that the panel of experts he already has called the Development Assessment Commission never seem to refuse anything and seem to blatantly ignore existing Development Plans. Urban Myth, who now lease the Mayfair Theatre on the corner of Victoria St and Goodwood Rd are seeking support to help to keep their organisation going. They have been helping teenagers develop acting skills for 33years in Unley. While you might not have $500 to spare to help them out even making an effort to attend performances would make a difference. Read the Eastern Courier's full story below. Down Under (TDU). The Stage 2 Start of the TDU will be held on Adelaide’s premier retail strip, King William Road at the Opey Avenue intersection, on Wednesday, January 21 at 11am. would again host a stage of the major sporting event. past 14 years,” Mr Tsokas said. street party, and will be held on Tuesday, January 20. I read with interest this morning a story about selling the rights to bury the dog in public places and then select a tree to plant at the site. The dog provides the fertilizer, the tree costs the Council nothing and someone also makes money selling the location and the trees to the grieving family. Sounds like a win: win for everyone and is to be investigated by Holdfast Bay Council. A few years ago one of Unley's Councillor suggested selling memorial sites for human ashes in our parks and everyone was outraged. I wonder how far this will go? I keep getting reminders from what a read and what I hear others discussing and the term caretaker mode keeps cropping up. The state government, in it's wisdom, has enacted laws that prevent Councils making major decisions from the time that nominations close for the Council election (Sept 16th) until the declaration of the poll in November. This effectively means that the business decisions that the current Council makes will end with the last Council meeting in August. So does this mean Council should put off decisions until November (with a new Council and at least some new faces) or should Council be rushing to make decisions now? When it comes to decisions about stormwater management Council is being encouraged by the Stormwater Management Authority to get the business done while the most effected people who live along the creek bank are asking for the decision to be slow, well informed and thorough. They are objecting to even the consultation on this occurring during caretaker mode. Are they right? They certainly have a good argument. It's been 3 half years since I started this blog during the election campaign in 2010. I that time the number of hits each day has risen gradually. Despite my computer skills I have managed to keep on finding things to write about that I, at least, find interesting. As of today the total number of hits has made it to 100,000. I generally now get 150-200 hits per day. Many of these do not come from Unley or Goodwood South but whether they are the same people checking in everyday or always different my blog site is not sophisticated enough to tell me. Please take the time to comment on stories on which you have an opinion and this will encourage others to do the same. Local government elections are held every 4 years, with the next one to be held in November 2014. If you are already on the State Electoral roll (in this Council area) to vote in State elections then you will automatically be on the Council voters roll and will receive voting papers by post. However, if you are a landlord, business lessee or resident non-Australian citizen you will no longer be automatically included on the Council roll. If you have been previously enrolled in that capacity, and are still eligible, you will need to re-enrol after 1 January 2014. 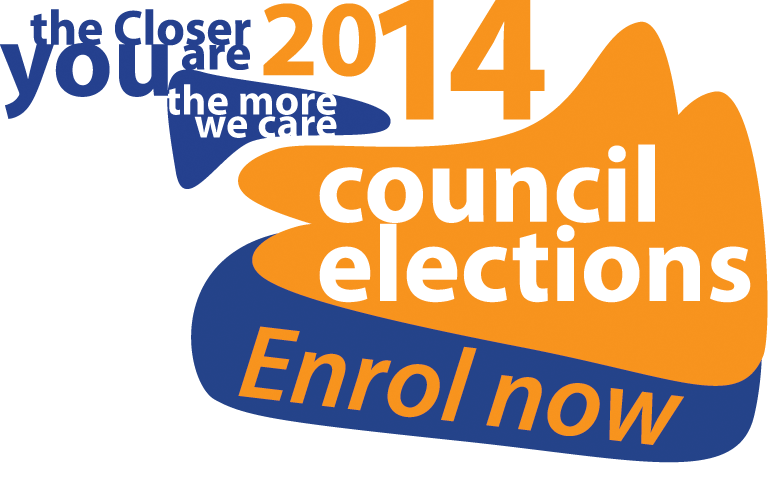 Enrolment for the 2014 Council elections closes at 5pm on Friday 8 August 2014. My daughter has been praising this bakery for a while. When I saw that the Village Baker at 715 South Rd, Black Forest had come second in a recent pie tasting competition (run by the Advertiser) I decided it must be worth a visit. I'm not a fan of lamb (I was raised on a sheep station and that was the only meat we ate for the 18 years I lived there) but will definitely be checking out what else is available. Belair timetable (including Millswood) feedback welcome!! In line with the commencement of upgrade works at the Millswood Station, a draft Belair train timetable that incorporates stops at Millswood station is available for customer comment. Once you’ve reviewed the timetable let us know what you think and complete our short survey. Councillors were briefed this week about the current status of the Brown Hill Creek investigations. A report will be coming to Council next week seeking further direction from Council. The full report into the 8 options will not be available by then and a further report will need to come to Council. The most viable options remain clearing the creek, widening and deepening the creek and a dam in the higher reaches of the creek. As yet I have not seen the costings for each and have not been reassured that the most effected creek owners are favourable to the widening and deepening option which ultimately effects them the most. In fact I believe that this option may not have support of many land owners and would, therefore, be costly to implement. The consultation for options as Brown Hill Creek passes through both Forestville Res and Orphanage Park have not yet been discussed with Councillors, however, Council also has a responsibility to ensure that the maximum water flow is enabled through it's property. Council also will soon enter Caretaker Mode (Sept 16th) and is not allowed to make major decisions during an election campaign. This may make further consultation difficult until November. However, it will allow those elected plenty of time to make a decision on the matter. Twice in the last couple of months I have been approached by residents about fence height and the need for sound mitigation. The first property was on Cross Rd, near the Emerson Crossing. The resident wished to put up a sound proof fence to the height of 2.4m in front of his delightful bungalow. Unfortunately, many months later I saw that his application had been refused as it was considered too high and not in keeping with the locality. The noise inside the house would be almost intolerable and the traffic on Cross Rd in never likely to be less than it is now. The more recent concern was from a resident on Goodwood Rd whose house is in the Millswood heritage zone; the prevailing fence type is low and cosmetic only. He needs a fence that is high and offering considerable noise mitigation. I'm sure Council's Development Plane never intended to capture these two dwellings but nevertheless has. Time for a change? Time for a little more Council bashing by the Advertiser this morning. While I could agree with the statement made by Ali Clark that 'local government does have a role because it presides in the communities where we live; if it was left to the state and federal teams everyday issues would be overlooked'. My recent blog on Brown Hill Creek will confirm this. However, while many issues are dealt with at the local government the legislation that surrounds those issues is state government made. The issue regarding the gum tree in Burnside is just that, its potential removal is caught up with state legislation regarding its size, species and position in relation to the dwelling. Council officers must treat each matter according to law and sometimes this takes time. Council staff are hardly small minded bureaucrats they are hard working and decent people who are trying to look after matters large and small. She also overlooked the role of your local Councillor, these people, including myself, are there to support residents in their dealings with Council and largely also do the job very well. In the end the entire debate about how to manage flooding from Brown Hill creek may come to nothing. The Federal government have this week ruled out putting in their $50 million share of the money. This project was to be funded a one third each from local, state and federal government. Councils have been working on this plan since 2006. I guess procrastination has paid off, after all this plan should have been completed years ago and it should already be offering the protection from flooding to residents that they deserve. As we are getting closer to a final solution (it should come to Council next month) it seems we are further than ever from getting anything done. What a pity! But can Councils and state government agree to go fifty: fifty? Can Councils afford to do it on their own? Even the current amount of money that Unley has budgeted for in it's long term financial plan is 5% of rate revenue/year: are you prepared to pay more ? It seems that the caretaker period of Council (the time between the call for nominations (Sept 2nd) and the final Vote count (early Nov) is going to be an interesting time for current Councillors who are seeking re-election. Not only can we not even open our own mail (this may seem like tragedy but I don't get very much mail sent directly to Council) it may be difficult to say what we think on blog sites such as this. Seems like some guidelines are in order to clarify and not stifle. When we put $300,000 in the budget for 2014/15 in the budget we were really just being hopeful that Goodwood Rd would get done this financial year. However, we now know that it tram line to Mitchell St) will be done and PLEC will be paying the other half of the money. This will occur in approx July 2015. In the meantime this will give Council an opportunity to reinvigorate the streetscape at the same time. This is a great opportunity and should really help to accelerate the already visible changes in Goodwood shopping. The following consultations are in full swing. If these are important to you then it is not too late to have your say: you can do it on line, write a letter or send an email. 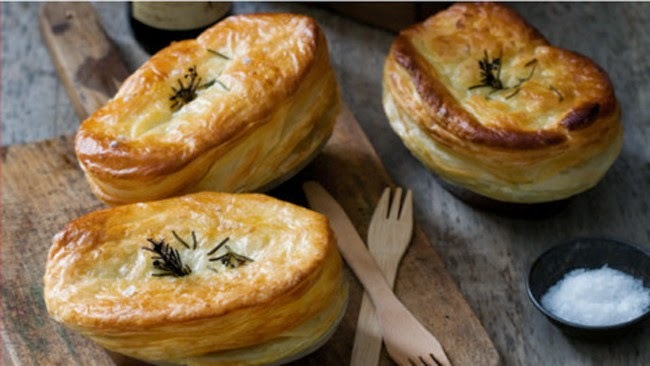 20 of Unley's businesses have been named as finalists in the 2014 Restaurant and catering Awards for Excellence. This announcement reflects in some way not only the flourishing food and Coffee scene in Unley but also the hard work done in business and economic development. The www.findyoureverything.com.au Council initiative developed by Matt Grant has contributed greatly to this success. An interesting article from the Winter Unley Life. e-Library is increasing as people discover how convenient the service is to use.“All you need is your library card and an internet connection - it’s that simple,” says Ms Hebdon. “But with a full programme of events scheduled over winter, your local Library is still well worth a visit.” And as for popular titles this season - Kristina has a few recommendations.